This traditional recipe has a unique aroma and is different from other podis / powders. White urad dal - 3 tsp. Select fresh and firm raw bananas. 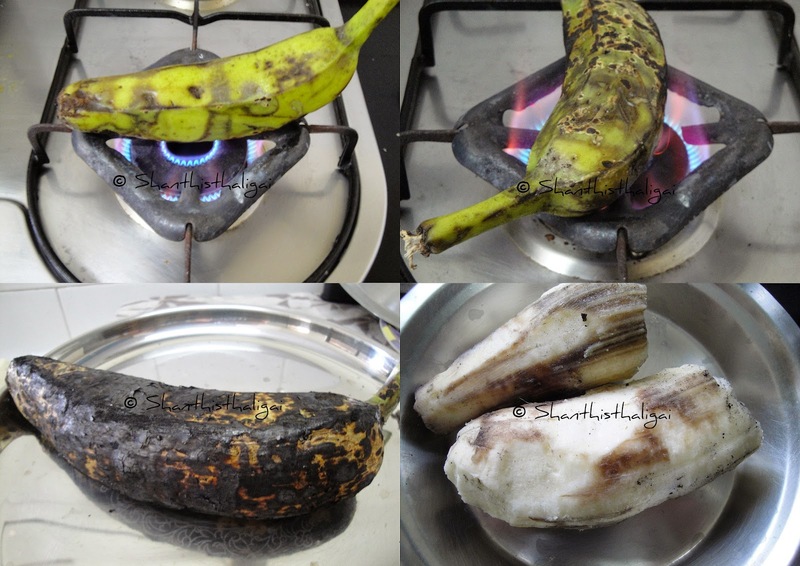 Roast the bananas on direct flame until completely black. When cool peel the skin and crumble coarsely with your hands. Heat oil in a pan and fry urad dhal, toor dhal, red chillies until golden brown. Add hing, switch off the stove. When cool grind in a mixie to a coarse powder, add the crumbled bananas, salt and pulse for a few seconds until all mix well. Mix with hot rice alongwith ghee or gingelly oil. Tastes great when accompanied with milagu kuzhambu or vatha kuzhambu and fried appalam. Stays good for a week as it is roasted in direct flame. my favourite to have with hot rice and ghee. Is this not Vazhakkai podimas? This is podi/powder. Podimas and podi are different. Can this podi be preserved for a week?